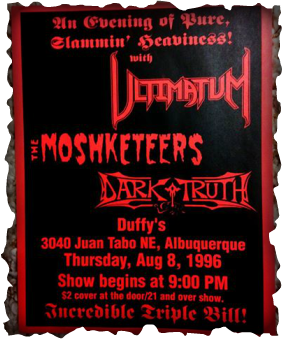 The Moshketeers come to us from Albuquerque, New Mexico where it seems that this area is rich in producing some fine Thrash Metal bands as Ultimatum is also from there. More specifically, The Moshketeers fall in the Crossover Thrash genre due to the shouted vocals. The Moshketeers formed in the mid-1980's and were originally a Heavy Metal band going by the alias ' Rapture.' (For more info on genres see Genres Defs). The band begain to change directions with their musical style and started going the way of Thrash Metal. Therefore the band thought it was necessary to change names to fit with the Thrash genre so they chose the name The Moshketeers. This new release of "The Downward Spiral," includes four bonus tracks that were originally released back in 1997 on a demo called "Pre-Release." This demo only had four songs on it and all four were included on the 2010 version of The Downward Spiral. Also included is the song "Ye!" which is the last song on this newer release and is a live cut off the original 1991 demo release of "The Downward Spiral." Once again keep in mind that all songs on the newer 2010 release have been remastered to sound their best including the demo tracks. 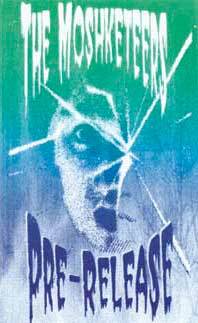 1989 demo "Vacation from Hell"
1991 cassette only release of the demo "The Downward Spiral"
2010 re-release "The Downward Spiral"
What The Moshketeers bring to the Metal scene with their 2010 re-release of "The Downward Spiral" is Crossover Thrash/Speed Metal that is lightly seasoned with Doom Metal influences. 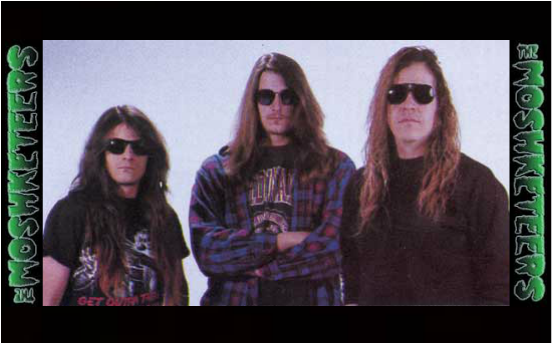 The song "Sin" opens with some Doom Metal guitar work then kicks into some fast thrash riffs. Another cool thing is that you can easily hear the base work on this tune. The song "The Downward Spiral" is full on Speed Metal played by one of the guitarist while the other guitarist is playing the Doom Metal parts which is an interesting combo of fast and slow guitar work which sounds pretty cool!! The song "Locked in Chains" opens with more Doom Metal then goes into some fast riff guitar then returns to more Doom Metal. The song "Ye!" has some nice base lines and drum work hammering our the Truth. The song "The Myth" The guitars really get after it on this one and there is some Doom Metal for all you Doom Metal Heads. Also there is some sweet base lines and some nice drums too. The song "Self Extinction" has a unique sound to it. The opening guitar play reminds me of the band Place of Skulls with its faster Doom laced guitar sound. The song "Epicurus" is another interesting tune because in the mid section of the song, there is an instrumental with some obvious Doom Metal guitar work then the song ends with Doom Metal as it fades out. The song "Posers of Deceit" is a straight forward smok'n Thrash song. The song "Grease the Duck" Is laced with more Doom influence as it sludges out the Truth. I also like the base lines on this one which reminds me, a little, of the music to the old comedy "Sinefield." The song "Nightmares" has some nice Thrash riffage alone with some Speed Metal. The song "The Life of Emptiness" delivers some heavy Speed Metal that will get you moving. The song "Return" seems to be more of an experimental track. 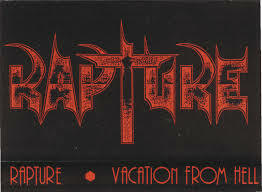 The song "Take My Life" opens with some sweet thrash riffs and has some nice drum kit work that really hammers it out. The song "Death or Life" with its guitar shredding, reminds me of the band Tourniquet a little bit. The song "Thelo Agnoia" has some nice base work on it. The song "Ye!" is off the 1991 demo of the "The Downward Spiral" and sounds pretty good to be a live take. Honestly I didn't realize before doing this review, that there was so many Doom influenced tracks on this album. It really shows the depth and talent of the band to incorporate these various styles of Metal into their package. It's also nice to be able to hear the base lines from start to finish on this disc. It seems that a lot of bands hide the base in the background but in reality, I think that bands can learn a lot from these moshers on how to let it shine more. I mentioned earlier that the Moshketeers and Ultimatum are both from the same area, Albuquerque, New Mexico but they also have another thing in common too. They both came together to do a gig back in 1996 as the Moshketeers opened up for Ultimatum on that fine Thrash'n night. Lyrically speaking, The Moshketeers are not trying to hide anything being full on in your face Christ centered lyrics. A Non-Existent Myth. God Doesn't Exist. Why Waste Your Time And Attack A Lie? If He's No Threat Why Don't You Forget? Why Do You Not Do The Same To Other Sacred Books Of Other Religions? Satan Is Sympathetic To Books That Lie, You're Just A Puppet On A String. Satan The Angel That Fell. And You'll Burn With Him If You Don't Repent. Is This Hard To Believe That You Can Actually Be Deceived? If you like old school Thrash, like I do, then this band comes highly recommended.